David Cameron is deservedly up against it, it seems, in trying to persuade the voters to see his public spending cuts in a positive light. Not surprisingly, many will marvel at how the greed and irresponsibility of the financial sector’s fat cats should somehow have been parlayed into the launching pad for what the Prime Minister admits is intended to be a long-term assault on the role of government. But it seems that he is determined to make the task even harder than it need be by insisting on offending his audience and then compounding one gaffe with another. His apology to a pensioner in Hove for depicting Britain in 1940 as a junior partner to the United States in the war against Hitler was achieved at the cost of offending a whole new range of people who might also claim to have played a role in 1940. David Cameron was almost pathetically keen to correct his blunder. He assured his critic that he was well aware of the true situation in 1940. Apart from, we were told, a few Polish and French pilots, Britain had stood absolutely alone against the Nazi threat. Well, no one who lived through those days (and admittedly I was only one at the time) could cavil for a moment at David Low’s famous cartoon following the fall of France and his sombre and defiant pledge, “Very well, alone.” Nor would anyone begrudge the recognition of those French and Polish pilots who played their part in helping to fight the Battle of Britain. But, while he was about it, one might have hoped that Britain’s Prime Minister would not so pointedly have revealed an apparently complete ignorance of the significant role played by pilots from the Commonwealth. Australian and New Zealand pilots in particular were especially prominent. Many distinguished themselves with feats of valour and daring; many lost their lives, flying alongside British pilots over British skies. The statue of New Zealander Sir Keith Park in Trafalgar Square is testimony to the leading role he played in helping to direct the Battle of Britain. And David Low himself was of course a New Zealander. New Zealanders and other Commonwealth citizens have long since reconciled themselves to the fact that their relationship with Britain has travelled a long way since a New Zealand Prime Minister could say at the outbreak of the Second World War “where Britain stands, we stand; where Britain goes, we go”, and then commit the farm workers and shopkeepers of his tiny country to a war half a world away in which they suffered a greater proportionate loss of life than almost any other country. We have grown sadly used to the euro-centricity of modern Britain that allows visitors from Europe to join the UK citizens’ queue at entry ports while New Zealanders must queue as aliens. We accept that Britain has the right to decide its own future, even if that meant turning its back on a trading partner which denied itself the produce of its own land in order to send food supplies to Britain at a time of great danger. What is disappointing, however, is that – in the course of correcting one error – today’s British Prime Minister could so thoroughly demonstrate how little value is given to the history that Britain and New Zealand, and the Commonwealth more generally, share. If, quite properly, he was ready to recognise the role of pilots from other countries, did he have to reveal so little awareness of the sacrifice made in that common cause by those from far-flung countries who chose to make that distant theatre of war their business too? It is one of the mysteries of the post-war world that a Britain which found itself at the head of the most extensive and potentially influential group of countries in the world – a Commonwealth embracing a quarter of the world’s population and some of the world’s most significant emerging economies – should so carelessly, through neglect and ignorance, have thrown that huge advantage away. If realpolitik counts for little, one might at least have hoped that common courtesy and common sense would have avoided giving unnecessary offence. Iran and Pakistan are bad enough. Does he have to add Australia and New Zealand to the list? What Is The Point of a Coalition If Only One Voice Is Heard? Nick Clegg’s performance in the election campaign’s televised debates promised briefly to stand election projections on their head. The voters seemed to decide when the crunch came, however, that more was required than a pleasant demeanour and a winning smile. Election arithmetic, though, came to his aid and gave him and the Lib Dems another chance to show what they were really made of. Sadly, he seems on course to demonstrate for a second time that there is no substitute for substance. Personality and personal relations do of course matter in politics; and it is certainly true that the personal chemistry- a shared social and educational background perhaps – between Clegg and Cameron seems to provide a glue that might hold the coalition together for a time. But, if the Lib Dems are to make a success of government, they need more than goodwill and a conviction that nice people will prevail. They need a searching analysis of the country’s problems and a hard-headed agenda for resolving them. That is especially important when they find themselves in bed with partners who are not only much bigger and nastier than they are but who have a positive surfeit of ideological conviction and a ruthless determination to make it count. Nick Clegg is simply ill-equipped to stand up to the George Osbornes of this world. He seems to have gone along with the basic strategy of cutting the deficit, come what may, without firing a shot. How else to explain the extraordinary spectacle of a supposedly left-of-centre party and its leader tamely endorsing a budget strategy that is positively perverse and that threatens a re-run of the global recession that similar neo-liberal doctrine produced less than two years ago? How is it that a financial crisis that failed to become a full-scale depression only because governments and therefore the taxpayers – and our government and our taxpayers in particular – bailed out the failed financial institutions has become the launching-pad for savage cuts in public spending and a punitive scaling back in the role of government? Why should anyone believe that throwing people out of work, and then cutting the support available to the unemployed, will somehow set the economy back on its feet? Why should anyone believe that the government’s finances – including an indebtedness massively increased by the billions spent on the bail-outs – can be restored by ensuring that tax revenues are depleted because economic activity is flattened? The government’s determination to give priority to cutting the deficit, at the cost of any other objective, makes sense only if economic policy is to be deliberately handed over to the perversely irrational. Our policy-makers seem to be running scared of the “bond vigilantes” – the very people whose irrationality created our problems in the first place – and to have a naïve faith on the other hand that the “confidence fairy” will work her magic. It will be interesting to see how long confidence remains in the face of this assault on common sense and economic reality. It is disappointing that this fairy-tale nonsense is swallowed whole by so many commentators, and that attempts to debunk it are portrayed as the ravings of the mindless and the angry. It is not – pace Guardian leader-writers – the duty of coalition ministers to close their ears to argument. 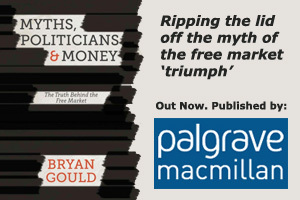 There is of course a distinguished and long-standing intellectual pedigree – from Keynes to Krugman, Stiglitz to Skidelsky – for the view that government’s responsibility in our situation is to maintain the level of economic activity, so that its own finances as well as those of others are restored as soon as possible. And, those with a knowledge of economic history will know that George Osborne is all too faithfully following in the footsteps of those like Herbert Hoover who followed similar policies in 1932 and plunged us all into depression. That pedigree and that hard-won experience are not so easily dismissed. We might have hoped that someone who chose to lead his party into government might have been better equipped for the task. Nick Clegg is not, sadly, unique among politicians in seeming almost totally bereft of any understanding of economics but nevertheless convinced of his fitness to make major decisions about our economic future. The least we can expect of our senior politicians, surely, is that they will make sure they know enough to be able to reach their own conclusions on the major issues of the day. It is not enough that these issues should be debated in the columns of our best-informed journalists. They should be debated at the very heart of government. What is the point of a coalition if only one voice is heard? This article was published in the online Guardian on 5 July. Let us make some entirely plausible assumptions about the outcome of the general election. Let us assume that the Conservatives attract the largest share of votes, but fall short of a majority either of votes or of seats. Let us assume that Labour comes second or third in terms of the number of votes but might actually win the greatest number of seats, though still well short of a parliamentary majority. And finally let us assume that the Liberal Democrats score well – and perhaps substantially better than was expected at the outset of the campaign – in both votes and seats and, as a necessary consequence, hold the balance of power. The first issue will be for the Queen and her advisers. In such circumstances, who does Her Majesty ask to form a government? Do her advisers stick to precedent and advise that Gordon Brown, as the incumbent and commanding the greatest number of seats, should get the nod? Or do they pay attention to the pre-election assertion by Nick Clegg that, as a proponent of proportional representation, he would support only the Party leader who had gained the biggest share of the vote? I suspect that the advisers would initially stick to precedent and that Gordon Brown would be asked to give it a try. I further suspect that, unless he were prepared to give a guarantee of a referendum on electoral reform, his attempt would founder on Clegg’s determination to stick to his guns. The failed attempt could, however, take some time before the failure became definitive. The Queen would then ask David Cameron to form a government. He would seem to have a better chance of success, being able to argue that he had won the greatest share of votes. Nick Clegg would again try to extract a major commitment on electoral reform, but Cameron would refuse to accommodate him. Clegg would, however, be compelled, for fear of being accused of irresponsibility and of forcing a second and unwanted election on the country, to do some sort of deal to allow Cameron to form a government. That deal would probably fall short of a formal coalition but might take the form of an undertaking to support the new government on issues of confidence and supply. It might be time-limited, but whether or not the deal included any such formal provision, the issues of how long it might last and of the circumstances in which it might be brought to an end would constitute the real story of the 2010 general election. The parties to the deal, both Cameron and Clegg, would have clear but conflicting strategic objectives. Both could imagine scenarios which would greatly advance their parties’ interests. Cameron would hope to emulate the experience of other leaders of minority governments who had used the prestige of government to underpin their electoral appeal and to push on in a second election to achieve an overall majority. Harold Wilson pulled this trick off twice. But it might not be so easy this time. Cameron has to grapple with urgent and desperate issues. He either begins to deal with them effectively and accepts the pain that will inevitably attend such an enterprise, or he ducks the issues and is easily attacked as failing to attack the country’s all too obvious problems. A year or two into a new Tory government, and the voters could be – one way or another – badly disappointed. The honeymoon this time might be a very short one. For Nick Clegg, the issues are almost equally daunting. His task will be to pull the plug on the new government at a time when he won’t be accused of irresponsibility and of plunging the country into further electoral turmoil. He will want an issue which will, from both a position of principle and of prospective electoral advantage, allow him to go to the country as the alternative government. He will argue that while he had played his part in providing stable government he could no longer support a Tory-led administration that was heading down the wrong path. But his long-term objective would rest on the assertion that the Lib Dems were now the only party that could both defeat the Tories and form a stable majority government. It is now 100 years since Labour began its push to supplant the Liberals as the alternative to the Tories. The Conservatives, like the poor, are always with us (and some would argue that there is a causal connection between the two propositions). The perennial question in British politics is as to who will constitute the alternative. Today’s Liberals have their sights on the real possibility of reversing 100 years of history. This article was published in the online Guardian on 5 May.